Australia’s Great Barrier Reef (GBR) is one of the seven Natural Wonders of the World, and contributes significantly to Australia’s economic, cultural and social values. The Reef is under pressure from current and historical management practices that have impacted upon water quality, including land clearing, destruction of coastal wetlands, dam construction, coastal development and shipping. Inshore biodiversity has declined as a result of these modifications, and a recent study by the Australian Institute of Marine Science stated 50 per cent of coral cover has been lost from the Reef in the last 27 years. As the largest river basin adjacent to the World Heritage Listed GBR, the water draining from the Fitzroy Basin has the potential to greatly affect reef water quality. To protect the Reef it is important that water quality is monitored and management actions are taken to limit the extent of damaging substances. Part of the challenge of managing water quality on the Reef is ensuring managers have timely and accurate access to water quality information and impacts. A cost effective way to monitor and manage water quality over the extensive area of the GBR lagoon is with the use of remote sensing technology. In 2012 BMA committed to being a part of the eReefs project, the first step in building comprehensive coastal information systems for Australia. BHP Billiton Mitsubishi Alliance (BMA) is Australia’s largest coal company, producing more than a quarter of Australia’s annual coal exports. The BMA coal mines operating in the Fitzroy Basin include Goonyella Riverside, Broadmeadow, Peak Downs, Saraji, Norwich Park (production ceased), Gregory Crinum and Blackwater. The mines are located in the northern Fitzroy Basin catchments of Upper Isaac, Theresa and Mackenzie, and all have in place environmental measures to minimise their impacts on the aquatic ecosystems which lead eventually to the Fitzroy River and the Great Barrier Reef lagoon. In partnership with the Australian and Queensland Governments and the Science and Industry Endowment Fund (SIEF), BMA committed in 2012 to contributing $5 million over five years to the Great Barrier Reef Foundation’s eReefs project, as a continuation of the company’s involvement with the Great Barrier Reef Foundation. BMA Asset President Rag Udd said, “The Great Barrier Reef is a place that’s loved and valued by all Queenslanders. BMA is very proud to be part of this important project aimed at protecting one of the iconic natural wonders of the world”. eReefs, established in January 2012, will transform the way the Reef is protected and preserved by taking the first step towards a comprehensive coastal information system for Australia. eReefs provides a platform for decision making and communication from catchment to ocean. 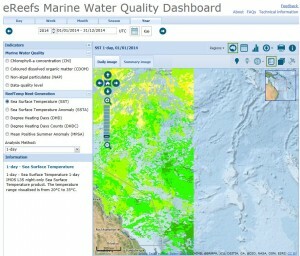 The first tool developed by eReefs is the Marine Water Quality Dashboard, released in March 2014. The online tool gathers and publishes information on reef water quality, improving access, visualisation and understanding of various indicators of GBR water quality. 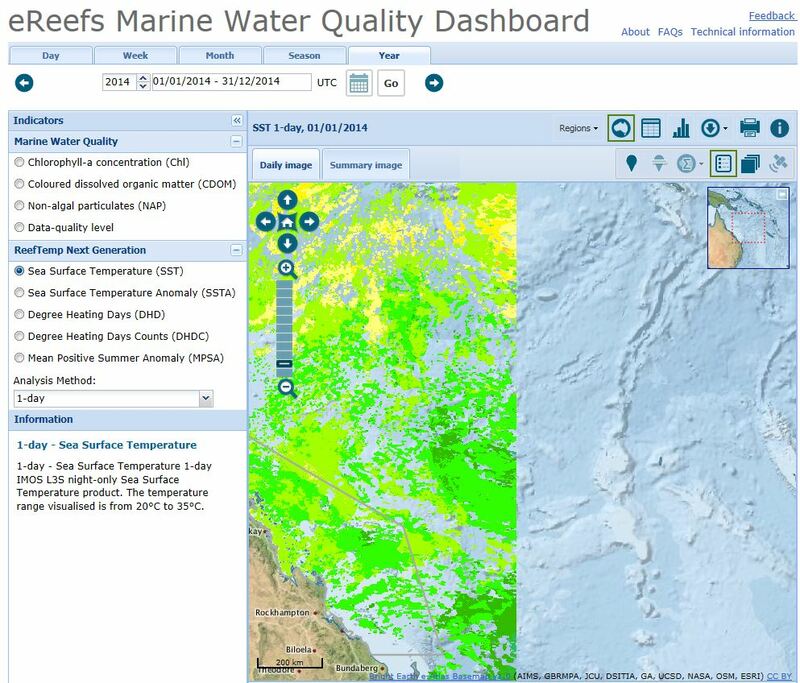 The Marine Water Quality Dashboard is powered by the Bureau of Meteorology’s daily satellite information and was developed by the Bureau in collaboration with the Australian Institute of Marine Science, CSIRO, Great Barrier Reef Foundation and the Queensland Government. It includes over ten years of water quality information as well as near real-time data for parameters such as sediments, chlorophyll levels, sea surface temperatures and light. It allows data to be either displayed online in a variety of formats or downloaded for analysis. The Dashboard utilises ocean-colour information from the MODIS (Moderate Resolution Imaging Spectroradiometer) onboard NASA’s Aqua satellite, which completes a polar orbit of Earth every 100 minutes. MODIS measures reflected sunlight, and the light reflected from within the water provides information about water quality. Data gathered by the satellite goes through a process of analysis and modification to calculate environmental properties such as sea surface temperature, chlorophyll-a and suspended sediment concentrations. eReefs will have many practical applications. For example, impacts of rainfall and flooding could be tracked through real-time visualisation of flood plumes advancing across the reef and over longer periods it will be possible to use eReefs as a platform for assessing and predicting the cumulative impacts of stressful events such as climate change, cyclones and land-based runoff. The data from eReefs may also be used to develop targeted management actions to minimise environmental impacts and to understand the interactions between individual threats and events. The product has been available online since March 2014. In the first two months of operation the site averaged around 450 unique views per month. The Marine Water Quality Dashboard is currently being used by GBRMPA to report on a range of water quality parameters as part of the Marine Monitoring Program that feeds into the production of the Reef Report Card. Prior to the release of the dashboard, this information was provided in an annual report to GBRMPA. Now they have access to the data on demand, with the ability to analyse the results on a daily, weekly, monthly, seasonal and yearly basis. The reef research community are set to benefit greatly from this new product. The Dashboard automates much of the tedious acquisition and pre-processing of the satellite information, corrections for atmospheric anomalies and application of algorithms allowing scientists to get directly to the water quality data. This increases the number of researchers that can make use of the information, and hopefully the number of research projects that improve our understanding of the impacts to the GBR. In the end, it is the Reef itself that will benefit from this enhanced understanding of the processes that act on the various environments across the region.